AET Flexible Space can now offer even more personal user control with the newly launched “FlexApp”. 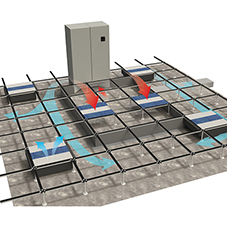 Underfloor air conditioning systems are commonly used in office environments, utilising the plenum beneath a raised floor as the ventilation zone. 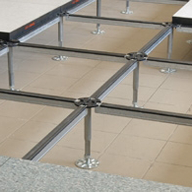 Fully conditioned air is supplied into the plenum by zonal downflow units (CAM), and is then supplied into the workspace via fan terminal units, known as Fantiles. Key features of the system include fast relocation of the plug and play Fantiles which easily adapt to changes in office layouts and the integrated Fatronic controllers that offer users personal control of their indoor environment. Using the integrated Fatronic controllers in the Fantiles, users can personally adjust fan speed and temperature to suit their own comfort. Access to the controller is via a specially designed hatch within the grille that covers the recessed Fantile. These are often not utilised as office workers are typically not accustomed to having control of their air conditioning. The new FlexApp will offer workers remote adjustment of temperature and fan speed settings on Fantiles via their android or IOS device, eliminating the need to physically adjust the settings on the controller via the hatch. The FlexApp has been designed with simplicity in mind and the user interface within the app has a strong visual display and powerful capability. 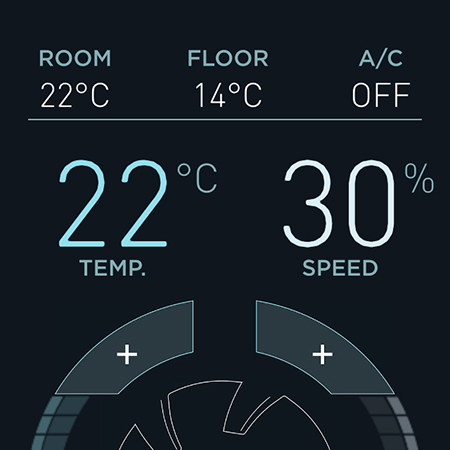 The app displays current room temperature and (under) floor temperature, and users can power individual Fantiles on or off, or adjust temperature (within specified range of setpoint) and fan speed simply with + and – buttons. The newly developed app for remote control of the units is currently available with the AET’s Flexvisor monitoring software and the latest E-panel control board.